This entry was written by whyevolutionistrue and posted on November 25, 2018 at 11:00 am and filed under ducks. Bookmark the permalink. Follow any comments here with the RSS feed for this post. Both comments and trackbacks are currently closed. result : claim is true. Honey is teaching her ducklings. Exactly what is the point of your comment? 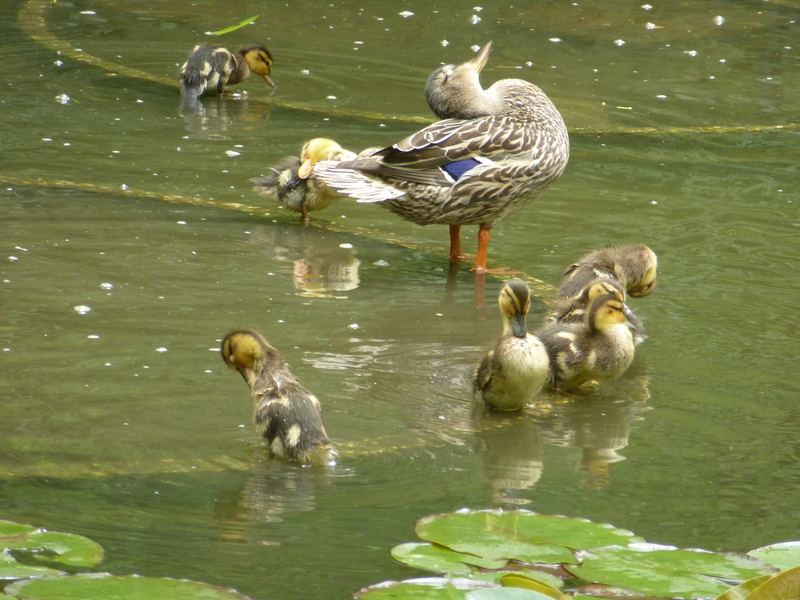 This photo captures just a moment in time, and the ducklings could well have been apeing her but it’s not in the photo. But I’m sure your inspection of this one photo trumps my months of watching Honey teaching ducklings to do this and that. What, exactly, prompted you to be a cranky smartass this afternoon? I apologize if my interpretation came across cranky and smartassed. I leave it to any parents out there to say if it’s just me. For the record, I read it as I think you intended — as a humourous observation of child behaviour. Maybe a smiley emoji or whatever they’re called might have cleared up the ambiguity, though. That helps – and it seems I’m not banned. I really didn’t need this today. See below for my Botany Pond cheer! The ducklings seem to be holding a “Who looks most like mom?” competition . It’s like a yawn. Once person, then the others follow reflexively. I wonder how much of typical behavior would develop in the absence of a “role model”. Would some things be left out? Would the chicks survive? My daughter raised chicks without their parent in the mix, but that wasn’t a fair test since they were domestic and cared for by her. Of all the photos one can keep, the animals are always the best. They are interesting and always seem special. Unlike people they don’t give you a hard time. Animals absolutely are interesting and special. Um, exactly how much time have you actually spent around animals? Lets see, I have been married for more than 42 years and through much of that time we have had cats. I won’t say more. He must mean pictures of animals. I feel awful about my comment even if anyone saw any humor in it at all. I’m really sorry. It’s a great photo, I love it, and every one on this series. I feel like I’ve ruined a beautiful thing. I’ve done this in my life before elsewhere and it is one of the worst feelings. And what’s worse is I’m making it about me now. Again, I apologize. Again I’m entirely sincere here. Your humor is subtle but, FWIW, I got it. If the ducklings had phones, they’d be looking at them. And no more WEIT for me today. I got the humour too, and thought it was funny. It’s hard to get stuff right in writing. I suspect that’s why emojis were invented. My main memory of this problem (because it came soon after I started having ideas about writing myself) was of a whole lot of Condaleeza Rice’s students being interviewed when she got the job in the Bush administration. One of them said, “She’s cool.” Because I read it in a newspaper I had no idea whether he liked her or thought she was a cold fish. I also got it — see my comment above. I also assume Prof Ceiling Cat would accept your clarification. Did you think of banding Honey so next year you would have a better chance of recognizing her. Molts affect the mandibles too. Srsly, I spent some time trying to find an answer, only to strike out. Well, I’d think the fact that Honey’s bill markings remained so similar over two years might mean her mandibles are less affected than average. A fond memory of the past vegetation season. So looong time till the next one :-(. Awwww!! What a beautiful capture of the moment!